Star Wars Yoda Candy Bowl | Nerd Much? Yoda is a juxtaposition, himself. One one hand, he’s a cute, kinda hairy, seemingly harmless little guy, but on the other hand, he’s a badass Jedi master that can take on the most formidable of villains. So, why not let him hold your candy, too? 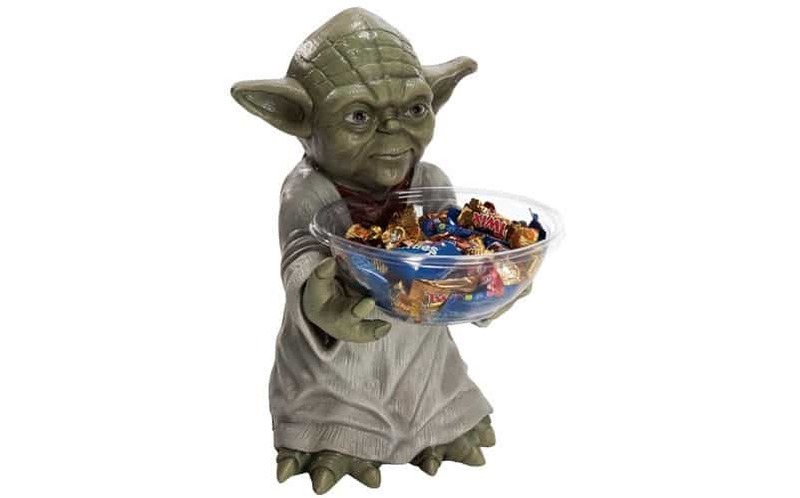 This 20″ tall Star Wars Yoda shaped candy bowl holder comes with a clear plastic bowl that’s perfect for holding your candy mixes, chips, or even your keys/wallet. So it doesn’t matter if you have a sweet tooth or a preference for the saltier variety of noms, Yoda will hold it for you. There are also other candy bowls available, including a Storm Trooper, Darth Maul, a Jawa, and a Boba Fett (although, admittedly, no one wants the Boba Fett). Especially with Halloween on the horizon, this candy bowl will come in handy. Twix candy bar, you must eat. For more cool stuff to buy that you don’t need, stay tuned to Nerd Much.